Utranazz range of swivel-tip Dumpers are ideal for the transportation of large quantities of materials where operator safety and 360o visibility are essential. Our heavy-duty Dumpers are fitted with a fully enclosed ROPS/FOPS cab with reversible driving seat to ensure operator safety in both directions (forward / reverse), making them perfect for tunneling work or confined construction sites. They are agile, easy to operate and extremely versatile, providing perfect traction and maneuverability on rough terrains, building sites and construction works. 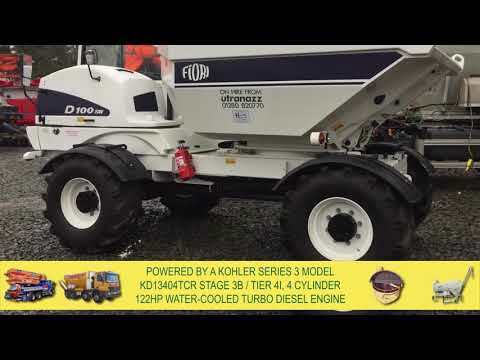 Utranazz Dumpers are available in the following load carrying capacities: 2,500kg, 4,000kg, 7,000kg and 10,200kg and are fitted with a 180o swivel-tip bucket. The 4,000kg, 7,000kg and 10,200kg models are fitted with reversible driver’s seat as standard, with the option of a 360o camera system and fire suppression system for maximum operator safety. Cab beacons and audible alarm signals are also fitted as standard to all models. All Utranazz Dumpers are 4-way steer, 4x4 wheel drive with Hydrostatic automotive transmission.